The monotony of being at sea is slowly starting to creep in with the team. The never ending routine of waking up and timing your jump from the bunk on to the cold damp cabin floor, whilst getting in to a position a contortionist would be proud of to get dressed, at the same time as being thrown around up and down left and right never fails to make me smile as I remember I volunteered for this!!! Then there is the fun of trying to get your food to the table let alone eat it. As both Shady and Matt B have found out, the galley floor is a precarious place. Imagine walking down a train carriage with a bowl of soup in one hand and the other hand for steadying, the train suddenly moves a different direction, yet you move the opposite. The result is comedy genius for those witnessing it, not so much for the victim. I blame our British sense of humour! This is the area where Shady and Matt B have been covered in food. The sailing part is easy if some of the crew were able to hold a course. It would seem we have a couple who believe the yacht has to manoeuvre around imaginary obstacles in order to reach South Georgia. This enables the food in the oven to gain momentum to leave the oven and end up on the worktop. Today I baked an orange and raisin cake, I am sure the Great British Bake Off team has nothing to fear from this entry. Preparation was to decipher Spanish instructions, luckily my guess of three eggs and 200ml of milk were correct for the cake mix. Next I had to mix the contents whilst the yacht was being steered by a madman on the helm. Then there was the baking part….easy if you are in a Victorian terrace, not so much at sea. As you can see from the picture you need to prop one edge of the baking tray with an empty tin and a spoon to wedge the tray in. I’ll leave the comments from the expert panel of critics onboard the yacht to pass judgement in tomorrow’s blog. My baking steadying device, AKA tin and spoon method. Today was shower day, the last one was at King George Island 4th Feb and looking at the picture it looks an easy feat, but that’s because the photo isn’t moving. The routine is to shut the door, strip, on water and rinse, off water lather body with soap, on water and rinse. Easy enough at home if you were tight and didn’t want the water meter to run away, on here we are limited by the ability of making our freshwater from sea water. This is all aided by the yacht moving around, it would be easier if you had just got inside a washing machine and went for a quick spin-cycle. This is the shower area, great if the yacht was stable! As I type this blog we are currently aiming to get the yacht to King Haakon Bay, South Georgia. 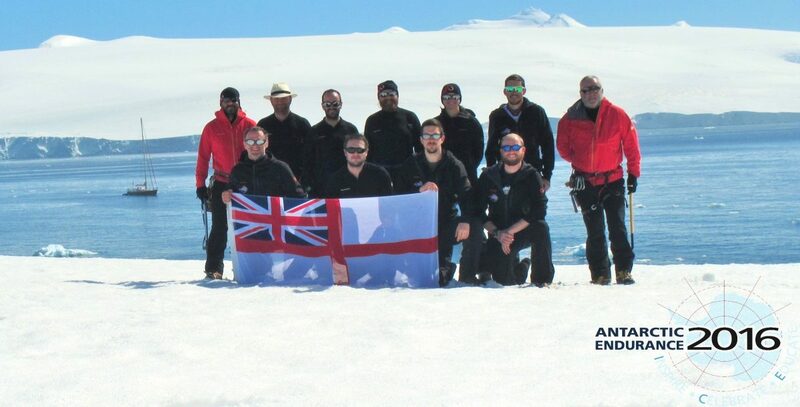 This will enable the team to depart the yacht and set up a base camp tonightbefore setting off on our yomp retracing Sir Ernest Shackleton’s footsteps. Dinnertonight is a beef stew and my cake, our last cooked meal before we transfer ashore and move on to ration packs, provided by Real Foods. Not that anyone will be complaining the menu and standard of food is second to none. Just to add it would seem we have our own Lara Croft Tomb raider, unfortunately for us this has come in the guise of Molly Macpherson Fridge raider at midnight. He would have pulled the raid off if hadn’t been for the brassband that came marching out of the fridge as the yacht heeled over and alerted Stephen the skipper. Molly’s response…… I was reorganising the fridge, unfortunately the Philadelphia cheese in his beard blew his cover. What made this worse was that only an hour beforehand we’d all enjoyed a pancake for Shrove Tuesday on the watch changeover, mass produced by Emily. Disclaimer: Over the last few days, there has been some artistic license during blog writing! I would like to point out that inter-watch banter is key to building team cohesion and spirit. That said, one should never let the truth get in the way of a good story. Secondly, in the words of Sir Winston Churchill – Don’t always believe what you read on the internet!